Defence prime contractor Austal Limited has reported its results for the six months ended 31 December 2016, with a net profit after tax of $9.3 million. Austal’s Australian segment reported revenue of $47.4 million (FY2016 H1: $105.6 million), with a segment EBIT of $1.7 million (FY2016 H1: $11.3 million). However, Austal expects FY2017 to be a year of lower profitability in Australia, as stated at its FY2016 results, given that the shipyard is completing previous programs and is now in the front-end design phase on two significant vessel programs; the $305 million Pacific Patrol Boat program and $90 million 109-metre Mols vehicle passenger ferry. The company's revised profit recognition treatment follows a more conservative process announced during the full year results in 2016, whereby profit will only be recognised progressively as significant first-in-class risks are eliminated. It is therefore likely that profit will not be recognised on the first PPB vessel until delivery scheduled for October 2018, although profit maybe recognised on the Mols ferry, which is a more standard ship type. In addition, Austal said current year profitability will also be affected by the two Cape Class vessels being completed for the Royal Australian Navy under a bank leasing arrangement. Austal said these ships will only generate accounting profit during the lease period rather than during construction, as would normally be the case. Austal delivered a 70-metre fast crew boat to Caspian Marine Services ahead of schedule in September 2016 under a US$34 million contract in a ‘hybrid’ build between the Australia and Philippines shipyards. This production approach can generate time and cost savings, which Austal says will continue to enhance their offerings to customers. Sustainment activities have generally been generating strong returns for the Australian business. Cape and Armidale vessel repair and maintenance activities, in Henderson and Darwin, have been running successfully and at a significantly higher level than in the past. Austal said this activity will be augmented in the second half with a substantial amount of support work on the Armidale remediation contracts in Henderson. 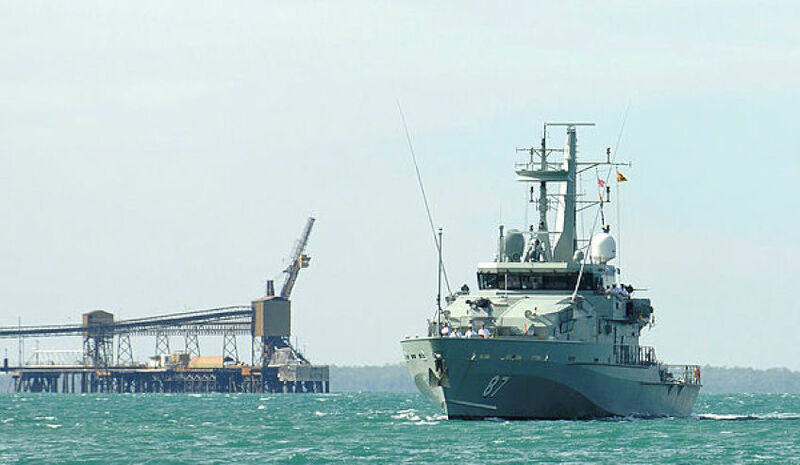 The business has recently increased its staffing levels in Cairns after taking over activities from another party to support Cape vessels now and Pacific Patrol Boats in the future. This will further increase Austal's profitable work. Offsetting this, the Cape Class management support contract is currently losing money because the company has had to provide significantly more resources than was anticipated in the contract. Austal said their priority has been to ensure that Border Force is fully supported as it carries out its important mission and they anticipate a contract amendment to recognise the additional resources required in due course. The earnings contribution from the Australian shipyard was lower than the half-year prior as anticipated, as major vessel programs progressed through their design phase. Earnings at the group level were impacted by a one-off event of a $13.2 million provision relating to the recent settlement of an arbitration matter from a commercial vessel delivered seven years ago. Austal chief executive David Singleton said the company is pursuing its strongest ever pipeline of work which, if successful, would positively impact across all 3 of its shipyards. However, there is much to do over the next 2 to 3 years to make that a reality and the management understands the criticality of the phase they are in, according to Singleton. "We are in the midst of bidding multibillion-dollar defence and commercial vessel opportunities that can be designed, built and sustained at our shipyards in the US, Australia and the Philippines," Singleton said. "The pipeline of work in Australia is significant. Austal is lodging its final bid for the 12 ship, $3 billion OPV program by the end of March, partnering with German shipbuilder Fassmer on the design. Longer term, the Future Frigate presents a major opportunity given our proven capabilities to design and construct complex, similar-sized vessels in the US. "Meanwhile, the pipeline for commercial vessels which are designed in our Australian facilities and usually built in the Philippines shipyard is at its strongest level in seven years. In support of this we are working on plans to extend the facilities in the Philippines and are carrying out new R&D work in Australia to further entrench our reputation for building the finest fast ferries in the world. "Underpinning the construction programs is the ongoing opportunity for support work in sustaining Austal-built defence vessels as they are deployed around the world. As our capability grows in both the USA and Australia, so does the opportunity."